In need of a last minute ride, detective Hercule Poirot hops aboard the Orient Express. One evening, a person is murdered aboard the train. Now, it's up to Poirot to solve the case when every passenger is a suspect. Remakes are an age-old tradition in Hollywood. If a movie or title is even the slightest bit notable, there's a good chance a remake will eventually be greenlit. Agatha Christie's "Murder on the Orient Express" is one of the latest films to be remade, this time with Kenneth Branagh at the helm as director. Branagh also fills the lead role of detective Hercule Poirot, though the real star of the show is his fabulous, outrageous mustache. Joining Branagh and his mustache is an all-star cast including the likes of Johnny Depp, Daisy Ridley, Leslie Odom Jr., Josh Gad, Michelle Pfeiffer, Penelope Cruz, Judi Dench, Willem Dafoe, and Manuel Garcia-Rulfo, just to name a few. 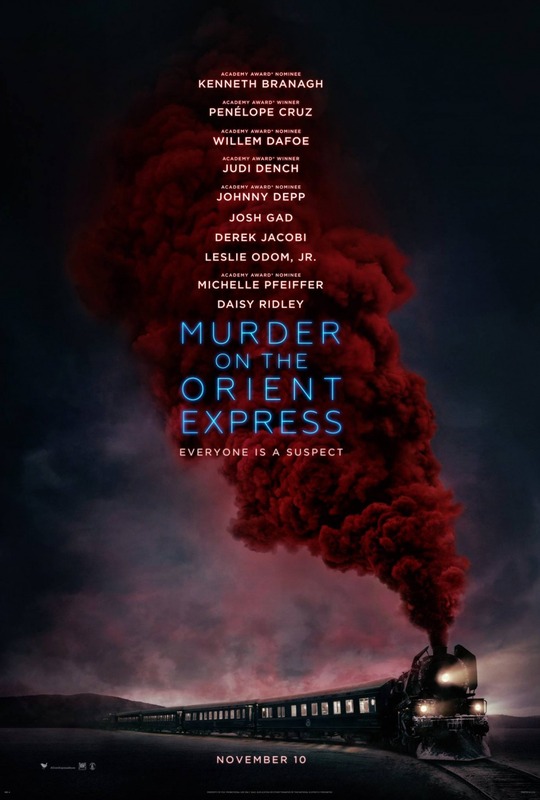 The film has a rather self-explanatory title as there has been a "Murder of the Orient Express" and now, it is up to the world's greatest detective Hercule Poirot to find the culprit. We weren't too familiar with the original 1974 version of this film or the book on which it is based. We had seen the '74 version once many, many years ago, but had all but forgotten it. For us, this story and its mystery are relatively new. We didn't know the ending before watching this new incarnation, so we had that going for us. Overall, this is a gorgeous period piece with beautiful scenery, sets, and lavish costumes. It's a very glossy, sharp looking feature. We also think the acting is mostly excellent, and with a cast like this one, how could it not be? A couple of the characters don't get lots of screen time, but the ones who do (Ridley, Pfeiffer, Gad) are great. Being an old school story, it does have a bit of a stuffy feel to it, but the pristine look and some new humorous elements give it a bit more accessibility. There's a lot of really interesting camera work and a few truly beautiful shots that help keep it visually engaging. Kenneth Branagh's "Murder on the Orient Express" is a fine adaptation. That being said, it does feel like there is something missing, especially in the ending which was underwhelming for BigJ, though that may have been the fault of the Agatha Christie and her source material rather than Branagh's rendition itself. In the end, we enjoyed this movie overall and think it is certainly worth a watch.